Our Drag-and-Drop Meal Planner makes your weekly meal planning a breeze! With our scrolling weekly meal-planning calendar, you can plan ahead or look back to see previous weeks. You will automatically be brought to your Meal Planner when you log in to the Real Plans website, but if you have navigated away from it or have scrolled ahead or back to other weeks, you can always get back to your current week’s Meal Planner by clicking on “Meal Planner” in the upper left corner. Use the arrows to choose the week you wish to view or plan, or select it using the calendar icon. Once you have navigated to the week you wish to plan, take a look at the meals that have automatically been planned for you. If you like them just the way they are, there is no need to make any changes, but what if you’d rather have Tuesday’s dinner for lunch on Wednesday? No problem! Just drag it over! Don’t want to have the Deviled Eggs recipe this week? Drag it to the trash bin. All you have to do is grab a recipe or a note and drag it where you want it to go to help craft the perfect meal plan for your week! From here, there are many things you can add to your Meal Planner. First, if you know the recipe you want to add, begin typing it in the “Search Recipe Box” section and select from one of the recipes listed. Click “Add” to add this recipe to your Meal Planner. Checking the box next to “Include Recipes from within My Diet” will give you only recipe choices that meet your dietary specifications. You can also add a note to remind you that guests are coming over on Thursday for lunch or that you will be eating out on Friday for dinner. Simply type the note in the box and click “Add” when finished. 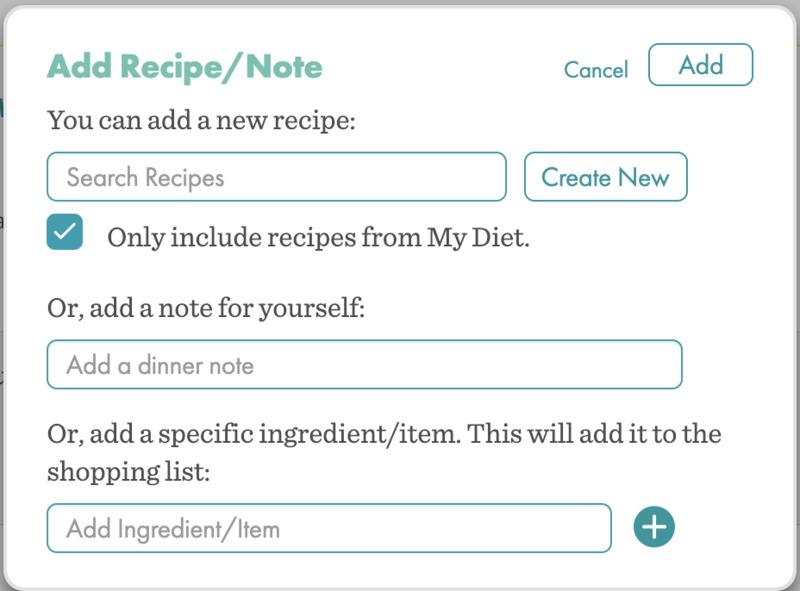 If you decide you’d like to add something to a meal, you can easily add that item straight from your Meal Planner. This will also add that ingredient to your Shopping List. 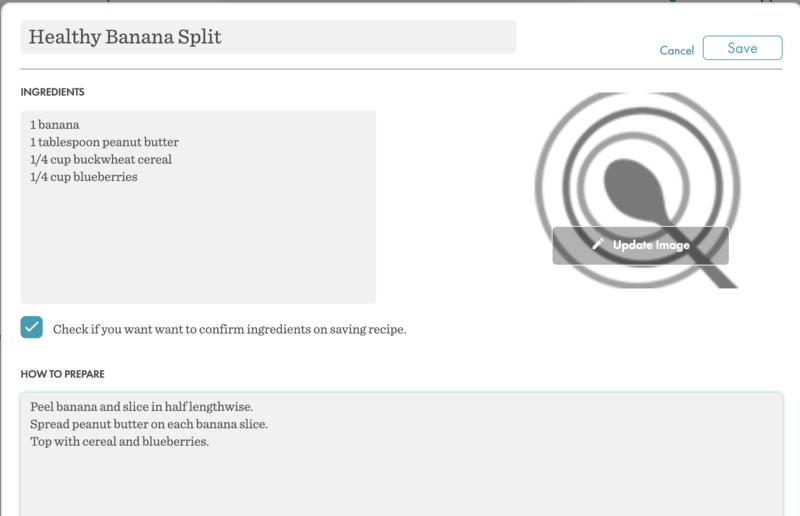 For example, if you want a banana for breakfast, type “banana” in the “Add Ingredient/Item” box and click on the + sign. You will then be prompted to tell how many bananas you need and where you want to buy them. This information will be used to add that item to your Shopping List. You can also schedule this item to be purchased at regular intervals, if you would like. 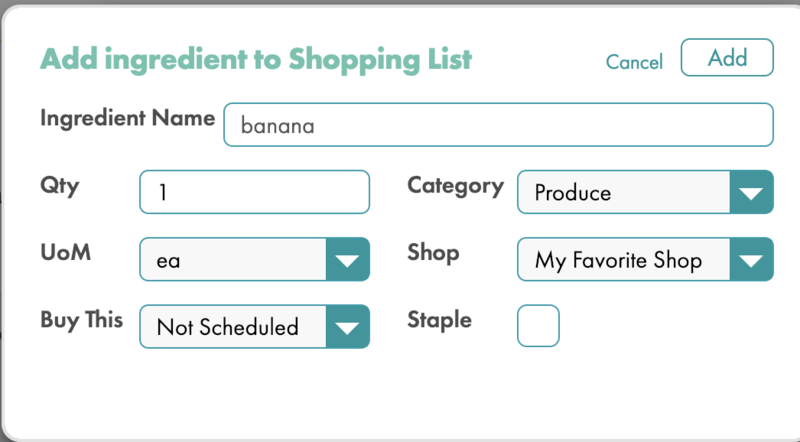 Click “Add”, and bananas will now be added to your Shopping List. Click “Add” once more, and bananas will be added to your Meal Planner for the meal you selected. 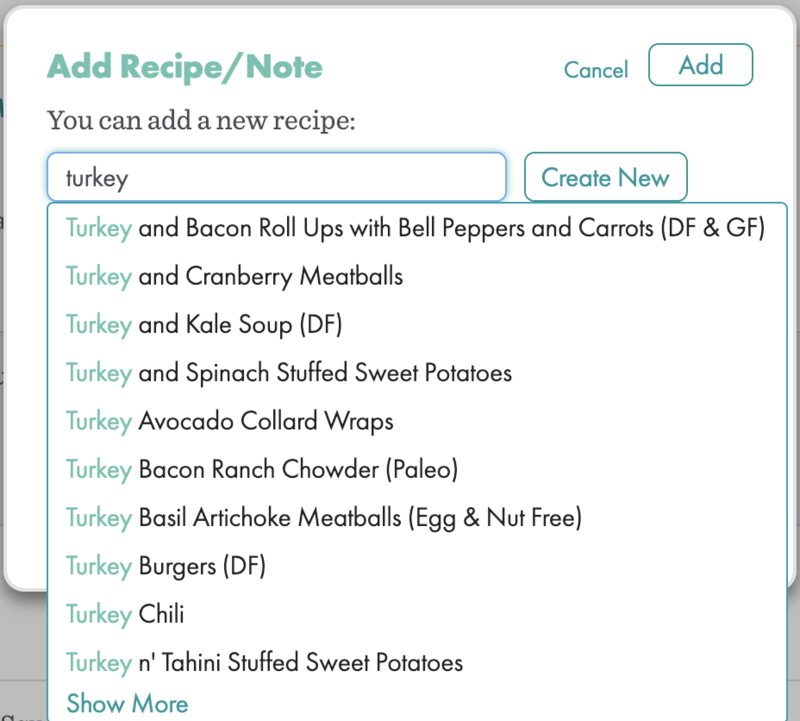 If you have your own recipe that you use often that isn’t in our database, you can select “Create New” to manually type that recipe into a recipe card to be added to your Recipe Box. Fill out the recipe card with a title, ingredients list, and procedures to follow. You can also add your own picture of the recipe, if you would like. Enter the correct preparation time, total time, and number of servings this recipe makes on the left side of the recipe card. Be sure to fill out the fields for Season, Diet Type, Course, and Main Ingredient in order for this recipe to be automatically generated into your Meal Planner. Click “Save” when finished. This recipe is now in your Recipe Box and can be selected in the “Search Recipe Box” field as described above to be added directly to your Meal Planner.